Metro Construction Management is the leading choice for tenant improvement construction in the United States. Whether you’re expanding across town or across the country, it’s important to keep costs under control while maintaining a consistent, high quality of build throughout the process. At Metro, we understand that successful buildouts are the result of careful planning, coordination, communication, and obsessive attention to detail at all stages of construction. We work hard to make the buildout process easy for our clients. Construction shouldn’t be a messy and complicated process. Metro Construction Management brings order and purpose to every stage of your tenant improvement project, from initial contact through project handover. Our project managers and superintendents are hands-on, tracking and controlling all aspects of construction to ensure that we complete your project on time and on budget. Many of our clients have businesses that must remain open during the construction process. We work closely with management to provide a safe construction experience that does not negatively impact our clients’ bottom line. Metro employs a variety of approaches to keep our clients’ employees and customers safe and comfortable during construction. Whether we work primarily at night, or adjust the traffic patterns in your building to accommodate a rotating construction schedule, the Metro team will work with you to complete the construction quickly, and in a manner that allows you to continue doing what you do best—serving your customers. In addition to self-performing key areas of the build, Metro maintains a nationwide network of highly qualified, proven subcontractors that provide work of the highest quality. As buildout experts, we know that the best way to ensure a superior outcome is to personally check the quality of the work, every day. Our experienced project managers and superintendents plan and inspect every part of the construction process to complete your buildout quickly, safely, and on budget. We personally confirm that every aspect of your tenant improvement project conforms to Metro’s rigorous quality standards. We know that one of the most important gifts we can give our clients is time. The Metro team specializes in constructing exceptional buildouts on an aggressive schedule. Our secret is clear and consistent communication between everyone involved in the build, including Metro’s project managers and superintendents, subcontractors, owners and the architect. Meeting a tight schedule is all about being proactive, and paying attention to the details. Our project managers and superintendents continually monitor construction progress to identify potential disruptions. 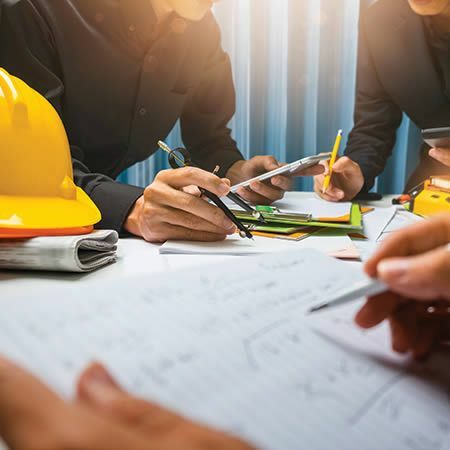 Once we have identified a risk to the budget or schedule, our team springs into action, coordinating the construction team to find a quick and effective resolution. Construction Site Safety is a 24x7x365 Exercise. The Metro team ensures the safety of everyone on the jobsite, from our project managers and superintendents to our clients’ employees and customers. We keep our work site clean, restrict access to areas where construction is in progress, and secure the site when we leave. Our daily and weekly safety discussions keep safety top of mind for our staff and subcontractors. We are well-known in the industry for having an impeccable safety record. Our clients and subcontractors know that we are dedicated to achieving a zero-injury work site on every project.